I love my son's school, they always have happy little events going on and tons of participation from the parents too. It's a small school, but trying to find a parking spot within comfortable walking distance can be quite the challenge if you're not significantly early for an event (not that we would know about such things, mind you ;) ). This morning was "Doughnuts with Mom Day" (they had "Doughnuts with Dad Day" last week but dad couldn't go, he has to be to work too early). It's basically just a morning of donuts and juice (coffee for the parents) and reading. And it's fun. The kids get excited about it, and the parents always like a chance to participate. I wish they did these kinds of things in the middle and high schools too, but I guess such things lose their luster of cool when the kids get older. I LOVED to read. I would beg my parents to take me to the library even in kindergarten. :) That's so fun! I was a library kid too. Still am if I have time. Reading is GOOD!! Donuts with Mom is good too. What a cute thing for the school to do. Awww...I remember these days too well. Sorta miss them too. Life was easier then. Sigh...enjoy these moments while you can. I remember those days too! I love when they do stuff like that in schools. Not only does it give the kids something to look forward to, it's so much fun for the parents. I wish it was cool to still do things with your parents in middle and high school. My husband is actually going on my daughter's Washington trip with her in 2 weeks and she is really excited he is coming along. I think if the opportunity was put out there, more parents would show up to these kind of events and I bet the students wouldn't be as upset about them coming as you would think. How fun! I get to have lunch with my 5 yr. old grandson later this month! I'm looking forward to it and he's always telling me all the things we're going to do at his school on this day....in one half hour!! I love when they do things like this..
love this and can't wait to do these kinds of things with chicken nugget! thanks for the visit today! 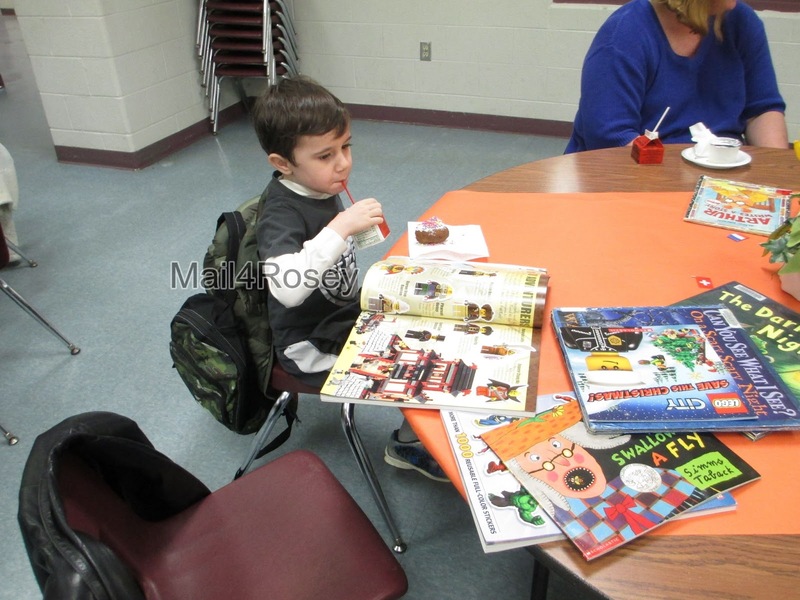 He even set his donut aside to look at books?! You have a great kid! It's nice to see your cheerful blog. My son likes to read a lot, but I still do a lot of the reading. I love to enjoy that school which takes into account the participation of all. Six books! Cute! Hope he keeps up the reading! I read to my daughter so much when she was little. Now that she's nine and reading is a daily homework task it's made it much easier. We will read together sometimes. I read my book, she read hers. It's a really great "bonding" time for us. - And we are relaxing at the same time. Growing up with my mom being a reader I believe has really helped my love of reading. My mom was a big reader too when I was growing up. In fact, a lot of the adults in the family were and I bet it did make a difference. I tried to follow you back but your profile is set to private. Thanks for the visit! My kids love to read books too, which I am very happy about (I am a huge book lover myself). Reading with them is a nice bonding moment:) Coffee and reading time together sounds like great way to start the day! Secondly, I think it's so awesome that the school does this! The only thing like that we've done in first grade is reading in the gym together, which is a K-6 thing during reading month. We lucked out and my husband was working on off shift during decorating with dads, and reading month last year, so he was able to go to both things. Hurrah that your husband got to go. My husband misses out on so many things because work starts early and ends late. I like the muffin and cookie decorating ideas! That does look fun! We have the same thing. The only thing that is different is that we're supposed to bring games, instead of read. I kind of like the reading better. Often times we don't have time to get through a whole game. what a wonderful and sweet way to begin your day...i love the his school involves the parents! i'm hearing more and more about schools doing daddy/daughter/son and mommy and me days. i think it's awesome and such a great way to bring everyone closer! What a fun idea! And, yes, the big kids would never want an event like that. I just finished looking at your birthday post of your daughter and that was really great! Thanks for linking and leaving a comment on Amanda's Books and More! We had something similar last month too but for any parent who wanted to come. My 6-year old really enjoyed it! I think it would be nice to have 'parents day' too, but they do a lot of fairs, carnivals, and such throughout the year where everyone comes. It was nice to have a little date morning w/my main man (5-yr old main man that is ;) ). Oh I just love this idea!! It is so nice to spend time with the little ones at school. Before school is a lovely idea, especially with the reading. I am going to suggest it to my school. Oh it is fun when they're little I hate that I never do anything with the boys. What fun! My granddaughter had those themed days the week before last at her school. I went to the one earlier this year but I was out of town on the last one. She took her daddy to the dad one, mommy to the mom one. She got several new books out of it too! No class moms where we're at (there's always the teacher and her reading coach in there full-time), but I volunteer and help out. Lots of the parents do. It's nice. When we lived in another state, getting volunteers was like pulling teeth. Wow...I wish my school had done this type of stuff. And I hope that when my son is in school, his does this too. I really want him to be a reader like I was when I was little. Thanks for visiting my blog (on the hop). This sounds like a lot of fun for the kids and parents alike. Coffee and donuts? What adult wouldn't love that haha. What a cute idea! My son's school won't allow them to have sugar anymore. All snacks have to prepackaged and no more than 200 calories. So I always have to send pretzels since that is the only thing that follows all the rules :) I love donuts though and if my son's school had this idea I would definitely go!! This is so precious! I love that they do this for the families.